When I snack, I try to stick to fresh fruits and vegetables, but sometimes I want something with crunch, not the moist crunch of a carrot but the carb-filled crunch of a potato chip. When I get really desperate for a treat, I leave the pre-packaged snacks–with their fat, chemicals, and processed ingredients–on the grocery store shelves and make my own healthy snacks using natural ingredients that I usually have in my pantry. My taste in snacks runs from the very simple (baked tortilla chips) to the unusual (roasted okra). But my very favorite, the one crunchy snack that almost everyone loves, is also the easiest to make: microwave potato chips. After dozens of under- and over-cooked batches of microwave chips, I’ve found that the best gadget for making chips is simply the glass tray in my microwave. I’ve also discovered that the way to get the chips crispy without burning is to stop the cooking just as they begin to brown, let them sit in the microwave for a minute, and then finish the cooking. I’m pretty confident that if you follow the instructions below, your potato chips will come out golden and delicious every time. It's easy to make "baked" potato chips right on the tray of your microwave. optional seasonings: chili powder, Creole seasoning, Old Bay seasoning, etc. Using a mandolin or v-slicer, slice one medium russet potato (peeled, if you like) as thinly as possible, taking care that all slices are the same thickness. 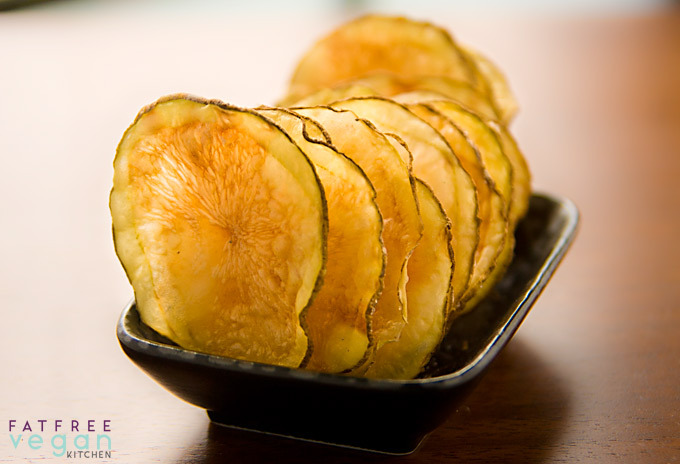 Line the turntable tray of your microwave with parchment paper and place the potato slices on it without overlapping. Salt lightly and sprinkle with your choice of seasonings. Microwave at full power–watching closely–until spots of brown begin to appear, about 4-6 minutes. Turn off the microwave for 1 minute. Microwave again at full power until the slices are golden brown. (Be very careful not to over-brown or they will taste burned.) Remove from the microwave and allow to cool. Repeat until all potato slices are cooked. 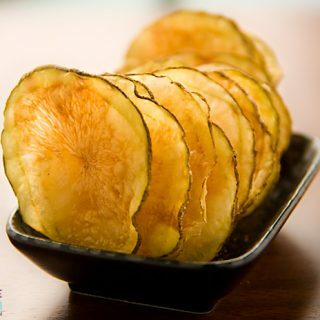 Salt and Vinegar Chips: Dip each potato slice into cider vinegar before putting it on the parchment paper. Sprinkle with salt before microwaving. 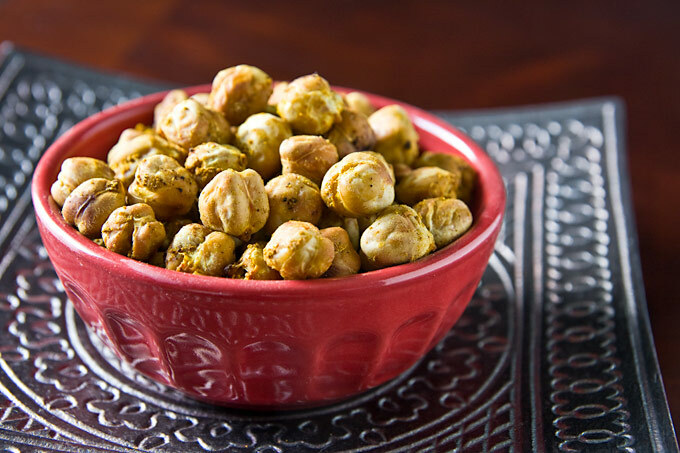 My favorite spur-of-the-moment snack is simple: rinsed, canned chickpeas sprinkled with Creole seasoning. 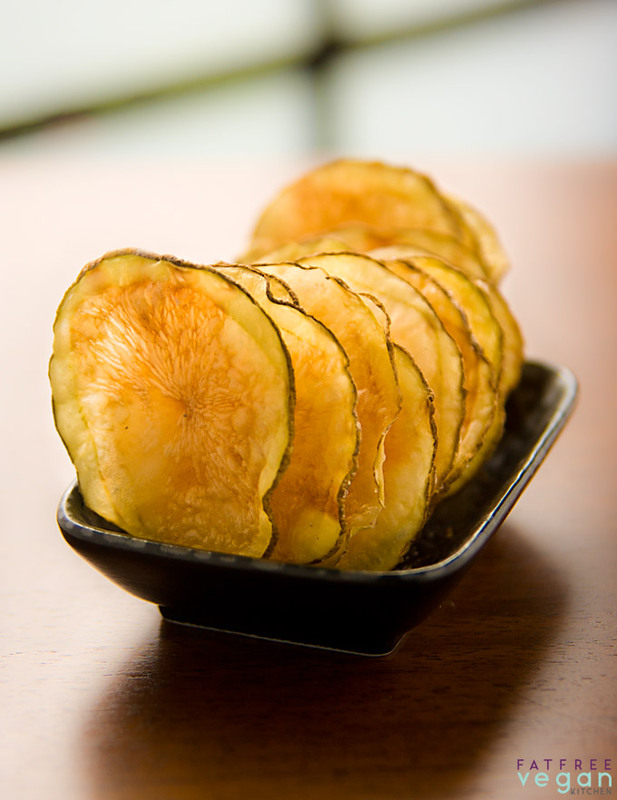 It’s hardly a crunchy snack, but it does satisfy the craving for salty foods. The problem for me is that it’s all too easy to over-eat chickpeas when they take so little effort to chew. That’s where roasted chickpeas come in: they satisfy the urge to crunch, and a few go a long way. 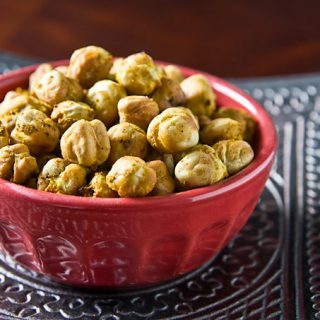 There are recipes all over the internet for roasted chickpeas, some using soaked dried beans and others using pre-cooked beans. I recently did a little experiment to see which kind I prefer. I made two batches, one using dried chickpeas and one using canned. I flavored the dried with lime and chili powder and the canned with curry. Overall, I preferred the canned–the texture was lighter and less hard than the dried version. Plus, they’re quicker to make, so they’re better in the case of a snack emergency. Both versions are below, so you can conduct your own experiment. 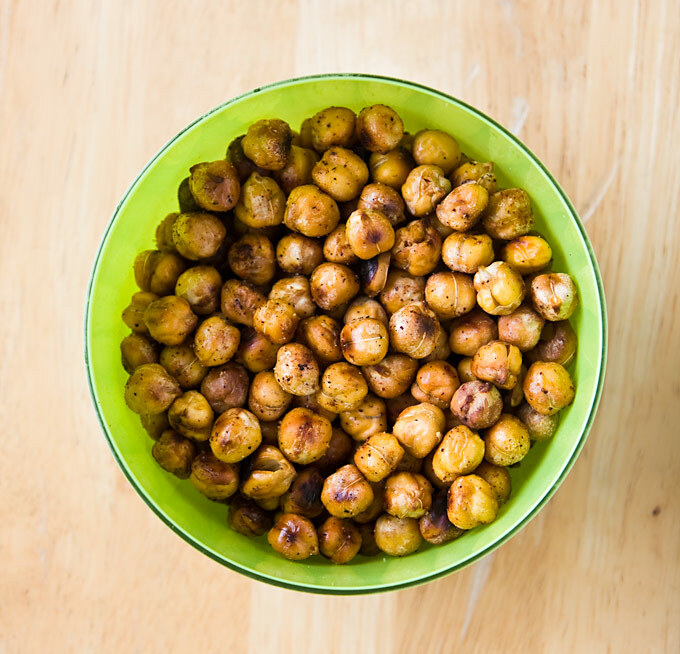 If you like your roasted chickpeas on the harder side, use this recipe that starts with uncooked chickpeas. Pick over and rinse the chickpeas. Cover them with water 2 inches above the level of the beans and let soak overnight. Drain and rinse the chickpeas. Put in a pot with enough water to cover and bring to a boil. Turn down the heat, add 1 1/2 teaspoons of the chili powder and simmer for 10 minutes. Drain. Place in a bowl and toss with the lime juice..
Preheat the oven to 400F. Lift the chickpeas out of the bowl with a slotted spoon and place them in a single layer on an oiled baking sheet. Stir after 15 minutes, brushing them with the lime juice remaining in the bowl. Repeat three times, the last time sprinkling them with the remaining chili powder and salt. When they are golden brown and crispy (about 50-60 minutes in total) remove from the oven . Cool completely before serving. Preheat oven to 400F. Combine all ingredients in a mixing bowl and mix well. Spray a baking sheet with canola oil and spread chickpeas out in a single layer. Bake, stirring every 15 minutes, until golden and crunchy, about 45-50 minutes. Cool completely before serving. This week I finally got around to trying a healthy snack that so many bloggers have said that they love. 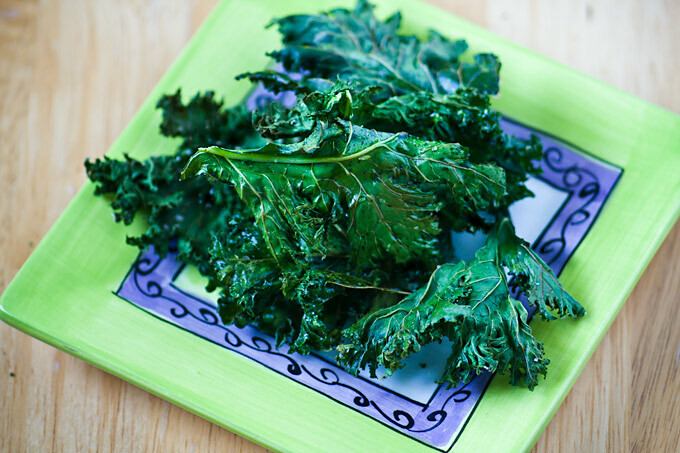 Kale chips sounded perfect–a green leafy vegetable magically transformed into a snack. Unfortunately, my family and I seem to lack the “kale chip gene.” Even after I baked them perfectly–not burned like my first batch or chewy/underdone like my second–we just don’t like them. Perhaps my kale was just overly bitter; if you give them a try, please let me know your opinion. Timing is crucial for these chips: too long and they taste burned, two short and they are chewy rather than crispy. Preheat the oven to 350F. Wash kale and cut into two-inch pieces. (Try to make the pieces all the same size or they will not cook at the same rate.) Spray a baking sheet with oil and place the pieces of kale on it in a single layer. Spray lightly with oil, if desired, and sprinkle with salt. Bake for 7 minutes. Turn the chips over and bake for 3-7 more minutes, until crispy and edges just beginning to brown. Cool and eat. 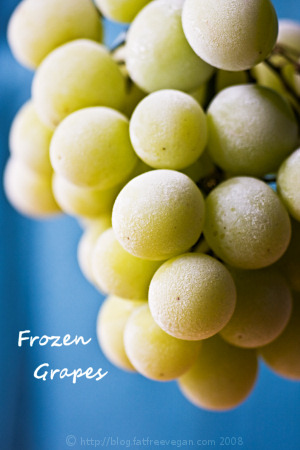 Ooops–Serene’s comment below reminded me to add this photo of one of my favorite summertime snacks, frozen grapes. I keep a bunch in the freezer so that it’s easy to grab a few when I’m hungry or hot or both! What’s your favorite low-fat snack? I’d love to hear about it. Feel free to leave a recipe or link to it in the comments section. I apologize if I’m duplicating, but haven’t the time to look through the comments. Thank you so much for your post…..I love these snacks for great healthy alternatives, especially the chick peas, probably my favorite snack. I am a salt & vinegar fanatic so I have soaked the chick peas in cider vinegar and then roasted them, oh the smell when they are cooking! I love it but if you are not a fan of s & v then you won’t like it. On another note, I have done my ‘chips’ almost the same way only they go in the oven on a large cookie sheet with parchment; brush lightly with olive oil, sprinkle with sea salt and then into the oven at about 425F. They will cook fast and crisp nicely. I do have to flip them over though. (I have a convection oven so I can throw in 2 or 3 trays at a time). But like you said you have to keep your eye on them….. Yum! Making them yourself is great since you know what just went into them! And my boys are thrilled that we can make them at home. They are great clean eating treats! 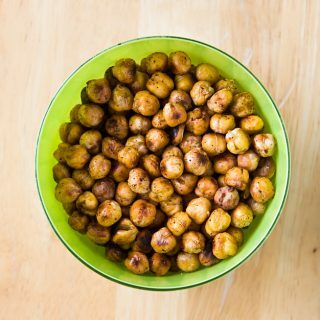 i don’t have an oven, can i make chickpea snacks crunchy in a frying pgn or microwave? No, They will explode in a microwave and probably won’t get crispy in a skillet. These looks great, thanks for sharing. I love kale chips! You might have better luck dehydrating kale chips instead of baking them. The first recipe I found for them were also baked, and they were ok, but when I tried dehydrating them, I was amazed how much better flavor they had! I usually add lemon juice, onion and garlic powder, and maybe nutritional yeast to what you have above. I have a bunch of fresh chick peas in the fridge! Can’t wait to try your recipe! Why won’t this save to my recipe box? I am logged in. Sorry about that! I thought that a recent software update might have caused problems, but I just tried saving it to my own recipe box, and it worked. If you have another browser, you might try seeing if you can save it from there. I wish I had an answer for you, but I’m at the mercy of WordPress, which has its quirks. Susan, your kale just needed to be embellished before baking. I mix some nutritional yeast with lemon juice and a bit of water, and mix in some mostly-ground raw sunflower seeds. Put the washed, torn kale pieces in a really big bowl, pour the mixture over, then mix super-well with your hands for a good five minutes. Put in a single layer on baking sheets and bake for at least 1 hour at 225 degrees. (Check after one hour – sometimes they take longer.) I’ve never had a bad batch. Thank you for the chickpea recipe! My daughter and I LOVE those baked garbanzo beans!!!! 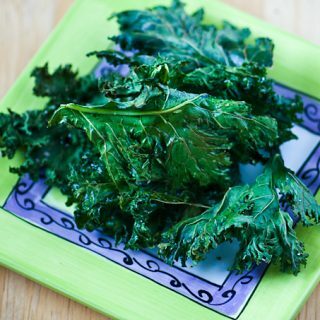 To make great crispy kale chips use lacinato kale they are less curly and bake more evenly. Cute the stems out, slice in two inch pieces, spray with olive oil, sprinkle with salt. Microwave on high for 3 minutes. Single layer on a plate. They will crisp without burning. If some are not crispy just microwave 30 seconds more until crispy. Easy and good. Also can I use sweet potato instead of potato for the potato chip recipe? I am with you on the “kale chip” divide. I love kale, and can eat it cooked or raw; I often toss it into breakfast smoothies using my Nutribullet. But the kale chips just never did it for me. They just seemed to disintegrate so that the “crunch” was barely a whisper. I’m going to totally try your potato chip recipe, though. Thanks for re-posting. One question, though – how do you store your potato chips and how long do they last? Sorry, Lou Lou–I’ve never stored the potato chips. I eat them as soon as they’re cooked! I’m curious. Have you ever tried making them with a dehydrator. I saw a few recipes on line, and I’m thinking of purchasing a dehydrator. I trust YOU and YOUR recipes because of all the success I have had with following them. AND I love your blog. Pampered chef makes a wonderful potato chip maker for the microwave! There are 2 sections that stack one above the other. They come out wonderful. I love your great snack recipes. OMG potato chip heaven! I no longer use oil and didn’t think it was possible to get a great potato chip. Never dreamt I could do it in the microwave. Love them! People who do not like kale chips often like the ones I make. I simple rip up the kale leaves, pour lime juice on the wet the leaves. (I use the organic bottled lime juice, fresh would be even better). Sprinkle nutritional yeast and sometimes I use seasoning salt too. toss it around in a big bowl until mostly wet and mixed. As I lay them out in my dehydrator I sometimes sprinkle a little more yeast on.Chips don’t need to be coved with the yeast/salt, but I like to have it visible on some of them. In my dryer they only take several hours to dry. These are very addictive when drinking a beer! Somehow those flavors just go together for me. I do not enjoy the lime flavored tortilla and potato chips but I like these!!! See if you like these better as the strong flavor is not the kale. I use NO oil on these.